Shriver was born in Westminster, Maryland, the younger son of Robert Sargent Shriver Sr. and his wife Hilda, who had also been born with the surname "Shriver" (they were second cousins). Sarge's elder brother was Thomas Herbert Shriver. Of partial German ancestry, Shriver was a descendant of David Shriver, who signed the Maryland Constitution and Bill of Rights at Maryland's Constitutional Convention of 1776. He spent his high school years at Canterbury School in New Milford, Connecticut, which he attended on a full scholarship. He was on Canterbury's baseball, basketball, and football teams, became the editor of the school's newspaper, and participated in choral and debating clubs. After he graduated in 1934, Shriver spent the summer in Germany as part of The Experiment in International Living, returning in the fall of 1934 to enter Yale University. An early opponent of American involvement in World War II, Shriver was a founding member of the America First Committee, an organization started in 1940 by a group of Yale Law School students, also including future President Gerald Ford and future Supreme Court Justice Potter Stewart, which tried to keep the US out of the European war. Nevertheless, Shriver volunteered for the US Navy before the attack on Pearl Harbor and said he had a duty to serve his country even if he disagreed with its policies. He spent five years on active duty, mostly in the South Pacific, serving aboard the USS South Dakota (BB-57), reaching the rank of lieutenant (O-3). He was awarded a Purple Heart for wounds he received during the bombardment of Guadalcanal. Shriver's relationship with the Kennedys began when he was working as an assistant editor at Newsweek after his discharge from the Navy. He met Eunice Kennedy at a party in New York, and shortly afterwards, family patriarch Joseph P. Kennedy Sr. asked him to look at diary entries written by his eldest son, Joseph P. Kennedy Jr., who had died in a plane crash while he was on a military mission during World War II. Shriver was later hired to manage the Merchandise Mart, part of Kennedy's business empire, in Chicago, Illinois. They had five children: Robert Sargent "Bobby" Shriver III (born April 28, 1954), Maria Owings Shriver (born November 6, 1955), Timothy Perry Shriver (born August 29, 1959), Mark Kennedy Shriver (born February 17, 1964), and Anthony Paul Kennedy Shriver (born July 20, 1965). The Shrivers were married for 56 years, and often worked together on projects. Shriver was admitted to practice law in the District of Columbia, Illinois, and New York, and at the US Supreme Court. When brother-in-law John F. Kennedy ran for president, Shriver worked as a political and organization coordinator in the Wisconsin and West Virginia primaries. During Kennedy's presidential term, Shriver founded and served as the first director of the Peace Corps from March 22, 1961 to February 28, 1966. After Kennedy's assassination, Shriver continued to serve as Director of the Peace Corps and served as Special Assistant to President Lyndon Johnson. Under Johnson, he created the Office of Economic Opportunity with William B. Mullins and served as its first Director. He is known as the "architect" of the Johnson administration's "War on Poverty". Hired by President Johnson to be the "salesman" for Johnson's War on Poverty initiative, Shriver initially was "not interested in hearing about community action proposals." The Job Corps movement was more consistent with his goals. Thus, soon after his appointment, Shriver "moved quickly to reconsider the proposed antipoverty initiative." During the 1972 Democratic National Convention in Miami Beach, Florida, George McGovern considered Shriver as a vice presidential candidate, but his campaign was unable to reach Shriver, who was at the time visiting Moscow, Soviet Union. McGovern then selected Thomas Eagleton instead, who later resigned from the Democratic ticket following revelations of past mental health treatments. Shriver then replaced Eagleton on the ticket. The McGovern-Shriver ticket lost to Republican incumbents Richard Nixon and Spiro Agnew. Shriver unsuccessfully sought the Democratic presidential nomination in 1976. In the months before the primaries began, political observers thought that Shriver would draw strength from legions of former colleagues from the Peace Corps and the War on Poverty programs, and he was even seen as an inheritor of the Kennedy legacy, but neither theory proved true. His candidacy was short-lived and he returned to private life. Shriver died on January 18, 2011, in Suburban Hospital in Bethesda, Maryland, at age 95. Shriver's family released a statement calling him "a man of giant love, energy, enthusiasm, and commitment" who "lived to make the world a more joyful, faithful, and compassionate place." President Barack Obama also released a statement, calling Shriver "one of the brightest lights of the greatest generation". Aaron S. Williams, the director of the Peace Corps, said in a statement, "The entire Peace Corps community is deeply saddened by the passing of Sargent Shriver." He further noted that Shriver "served as our founder, friend, and guiding light for the past 50 years" and that "his legacy of idealism will live on in the work of current and future Peace Corps volunteers." He is buried alongside his wife Eunice at St. Francis Xavier Cemetery in Centerville, Massachusetts. 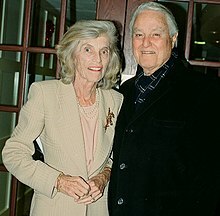 In December 1993, the University of Maryland, Baltimore County created the Shriver Center in honor of Shriver and his wife. The center serves as the university's applied learning, civic engagement, and applied learning organization. The Shriver Center also is home to the Shriver Peaceworker Program and the Shriver Living Learning Community. Shriver was an admirable, principled, and conscientious man who respected the dignity and sanctity of human life, and he also happened to be a contemporary and in-law of Kennedy. Not only did Shriver represent a "link" with JFK, but he represented a particular culture of white ethnic Catholic Democratic politics that has been gradually disappearing for the last fifty years. A pro-life Catholic, Shriver had been a founding member of the America First Committee, and more famously he was also on the 1972 antiwar ticket with George McGovern. In short, he represented much of what was good in the Democratic Party of his time. The film Too Young the Hero (1988), about the life of Calvin Graham, features a scene during World War II in which Graham (played by Ricky Schroder) meets Shriver (played by Carl Mueller). Al Conti portrays Shriver in the 1983 miniseries Kennedy. He is played by David De Beck in the 2018 film Chappaquiddick. ^ Herbert, Bob (April 23, 2004). "A Muscular Idealism". The New York Times. Retrieved December 5, 2008. ^ a b c d e f McFadden, Robert D. (January 18, 2011). "R. Sargent Shriver, Peace Corps Leader, Dies at 95". The New York Times. Retrieved January 18, 2011. ^ Remarks at the Swearing In of Sargent Shriver as Director, Office of Economic Opportunity. The American Presidency Project. Retrieved 7 May 2015. ^ Shorter, Edward (2000). The Kennedy Family and the Story of Mental Retardation. Temple University Press. p. 61. ISBN 1-566-39782-0. ^ "The New Nominee No Longer Half a Kennedy". Time. August 14, 1972. Retrieved September 27, 2008. ^ Kauffman, Bill; Sarles, Ruth (2003). A story of America First: the men and women who opposed U.S. intervention in World War II. New York: Praeger. p. xvii. ISBN 0-275-97512-6. ^ Schoifet, Mark (January 19, 2011). "Sargent Shriver, Kennedy In-Law, Founder of U.S. Peace Corps, Dies at 95". Bloomberg. Retrieved February 22, 2011. ^ a b Patricia Sullivan; Emma Brown (January 18, 2011). "Sargent Shriver dies at 95; founded Peace Corps". The Washington Post. Retrieved January 21, 2014. ^ "R(obert) Sargent Shriver: Papers (#214) - John F. Kennedy Presidential Library & Museum". Jfklibrary.org. Retrieved February 22, 2011. ^ Shriver, Mark (June 5, 2012). A Good Man: Rediscovering My Father, Sargent Shriver. Henry Holt and Company. ISBN 9780805095326. ^ a b "Sargent Shriver". Fried, Frank, Harris, Shriver & Jacobson LLP. Retrieved June 7, 2008. ^ "Sargent Shriver and the politics of life". National Catholic Reporter. August 30, 2002. ^ "Pro-Life Liberal Sargent Shriver Dies". Catholic Online. January 19, 2011. Archived from the original on January 24, 2011. ^ a b Mehren, Elizabeth (January 18, 2011). "R. Sargent Shriver dies at 95; 'unmatched' public servant and Kennedy in-law". Los Angeles Times. Retrieved January 18, 2011. ^ "About the Peace Corps : Past Directors". Archived from the original on December 26, 2003. Retrieved May 7, 2015. ^ "W. B. Mullins, 52, A Founding Official Of the Peace Corps". The New York Times. May 16, 1990. Retrieved May 23, 2010. ^ "Head Start History: 1965-Present" (PDF). Pennsylvania Head Start Association. Archived from the original (PDF) on May 15, 2011. Retrieved January 21, 2011. ^ "Diplomacy: The Liveliest Ambassador". Time. November 1, 1968. Retrieved January 18, 2011. ^ Clymer, Adam (January 18, 2011). "Sargent Shriver's America". The Daily Beast. Retrieved March 21, 2016. In fact, McGovern said this week, he probably would have chosen instead of the ill-starred Eagleton at the Miami Beach convention, but Shriver was traveling in Russia and could not be reached by phone to be offered the nomination. ^ "JFK Presidential Library Opens Sargent Shriver Collection". John F. Kennedy Presidential Library & Museum. February 1, 2005. Retrieved June 7, 2008. ^ Shriver, Maria (April 28, 2004). What's Happening to Grandpa?. Little, Brown Young Readers. ISBN 978-0-316-00101-4. ^ Benzie, Robert; Ferguson, Rob (May 31, 2007). "Terminator gunning to save lives; California governor, McGuinty sign stem-cell research deal in bid to `cure a lot' of illnesses". Toronto Star. Retrieved June 7, 2008. ^ HBO Documentary, The Alzheimer's Project, 2009, Grandpa, Do You Know Who I Am? with Maria Shriver. ^ "Special Olympians, family celebrate Eunice Kennedy Shriver". Associated Press via turnto10.com. August 13, 2009. Retrieved January 20, 2011. ^ Potempa, Philip (September 1, 2009). "OFFBEAT: Sen. Ted Kennedy's funeral unites family with words of inspiration". Times of Northwest Indiana. Retrieved January 20, 2011. ^ a b c McGuire, Bill (January 18, 2011). "Sargent Shriver Dies: Peace Corps Founder, VP Candidate". ABC News. Retrieved January 18, 2011. ^ "Peace Corps Mourns the Loss of Founder and Visionary Father, Sargent Shriver". News Releases & Statements. Peace Corps. January 18, 2011. Retrieved January 19, 2011. ^ Schada, Emilie (Fall 2005). "Shriver, Robert Sargent (Informational Paper)". Learning to Give. Retrieved January 18, 2011. ^ "Our Founder, Sargent Shriver". SHRIVER CENTER: Sargent Shriver National Center on Poverty Law. Archived from the original on May 16, 2006. Retrieved January 19, 2011. ^ "Hands-on lessons for Shriver students". Gazette.net. November 14, 2007. Retrieved February 22, 2011. ^ "New school year, new elementary school". Gazette.net. September 13, 2006. Retrieved February 22, 2011. ^ "Who is Sargent Shriver?". Montgomeryschoolsmd.org. January 24, 2011. Retrieved February 22, 2011. ^ "US President - D Primaries Race - Feb 01, 1976". Our Campaigns. Retrieved February 22, 2011. Stossel, Scott (2004). Sarge: The life and times of Sargent Shriver. Washington, D.C.: Smithsonian Books. ISBN 978-1-58834-127-3. Shriver, Mark (2012). 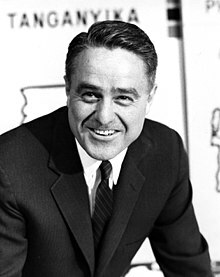 A Good Man: Rediscovering My Father, Sargent Shriver. Henry Holt & Co. ISBN 978-0805095302. 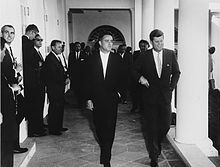 Wikimedia Commons has media related to Sargent Shriver.